I think it's pretty safe to say Phil Mickelson won't be returning to the 2018 Ryder Cup venue any time in the near future for an appearance at the HNA Open de France. Mickelson, who now holds the record for most Ryder Cup matches lost, has spoken out about his poor performance at the Ryder Cup and bemoaned the difficult set-up at Le Golf National which was 'not the way I play'. The five-time major winner, who was selected by Jim Furyk as a wildcard pick for this year's contest and went on to lose both matches he played in, was speaking after he carded a seven-under-par 65 at the PGA Tour's Safeway Open on Thursday. And while Captain Furyk had been complimentary about the course and the set-up, Mickelson said that playing a course set-up like Le Golf National is 'a waste of my time', complaining about the small fairways and heavy rough. 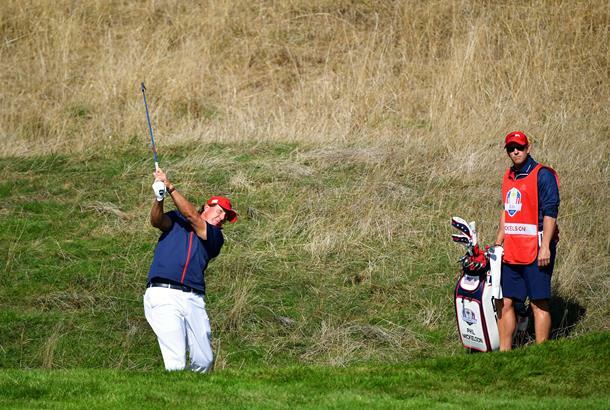 'The Europeans did the opposite of what we do when we have the Ryder Cup here,' said Mickelson. 'The fairways were 14 to 16 yards wide. 'Ben Hogan, who was the greatest ball striker of all time, had a five percent margin of error. 'So, if you hit the ball 300 yards, we all hit it more than that, you need to have a 30-yard wide fairway to be able to hit them. 'The fact is, they had brutal rough — almost unplayable — and it's not the way I play. I don't play like that. Here, I can miss the fairways, I can get shots out of the rough up on the green and it's playable. 'I'm 48, I'm not going to play tournaments with rough like that anymore. It's a waste of my time.